This workshop is aiming at sharing/exchanging recent progress/knowledge of energy storage methods by use of hydropower plants. What is a role of hydropower plants for increasing of unstable renewable energy systems? This workshop is aiming at sharing/exchanging recent progress/knowledge on prediction of hydraulic characteristics/fluid flow phenomena pumps, not merely competing the accuracy. A three-stage centrifugal pump designed and used in so-called "HPC Project" conducted by Turbomachinery Society of Japan (TSJ) is a target pump in the session. Geometry (CAD) and published measured data is open for anyone who wants to join us by applying his/her original method for prediction of performances and etc. Now we are welcoming your challenges and contributions to this session!! The test pump as a three-stage centrifugal pump consists of a suction casing, three identical impellers, three identical diffusers and two identical return channels and a discharge volute casing as shown in the figure below. A balance drum is employed for a balancing device. Thrust force characteristics, unsteady fluid forces and pressure fluctuations at diffuser throat as well as hydraulic performances have been measured. Also the effects of axial offset of the whole rotor on these characteristics have been investigated. Main results are available in the following reports. 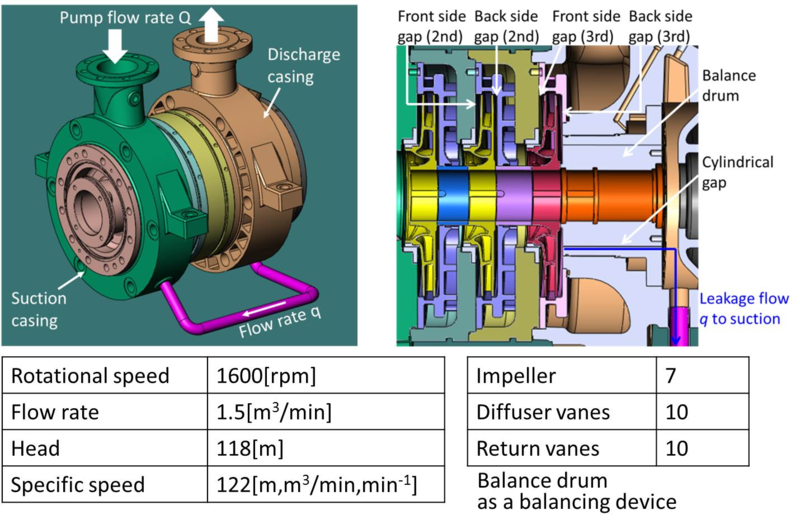 Yamashita, T., Watanabe, S., Hara, Y., Watanabe, H. and Miyagawa, K., 2015, "Measurements of Axial and Radial Thrust Forces Working on a Three-Stages Centrifugal Pump Rotor," Proceedings of the ASME-JSME-KSME Joint Fluids Engineering Conference, AJK2015-33515. Watanabe, H., Yamashita, T., Watanabe, S. and Hara, Y, 2015, "CFD Analysis of Axial Thrust in Three Stages Centrifugal Pump at Design and Partload Conditions," Proceedings of the ASME-JSME-KSME Joint Fluids Engineering Conference, AJK2015-02272. D. Furukawa, Yamashita, T., Watanabe, S., Hara, Y., Watanabe, H. and Miyagawa, K., "Axial and Radial Thrust Characteristics of a Three-Stage Centrifugal Pump with Axial Offset of Rotors," Proceedings of The 13th Asian International Conference on Fluid Machinery, AICFM13-057 (2015). The final stage model of the above target pump (see below) is also available for people who prefer to concentrate on a single stage with less computational resources. The experiment with this model is now being planned and the measured data will be hopefully open at the workshop. "fmnabe"+"@"+"mech.kyushu-u.ac.jp to request those files.